This looks like something small, an impression that is reinforced by the fact that the bird is perched atop a weed. Even though the head is turned we can still see that the bill looks short and rather thick. The thick bill along with the streaky plumage looks good for a finch, sparrow or some other kind of seed-eating bird. A female or immature Rose-breasted Grosbeak might come to mind but an RBG would be chunkier and have prominent white wingbars. A female or immature Dickcissel would show some yellow on the underparts and wouldn't be as heavily streaked as our quiz bird. Lapland Longspurs in non-breeding plumage are basically brown and streaked like our candidate but would have some rufous in the wings and black, not pink legs. Also, though not out of the realm of possibility, a Lap probably wouldn't be found perched on top of a weed like our quiz bird. Smith's Longspur would have buffy underparts.The face pattern looks too bold for a House Finch and a Purple Finch would have a more prominent dark face patch. A Purple Finch would also be more compact in shape than our quiz bird. Female/immature/basic male Bobolinks have buffy or yellowish underparts. A female/immature/basic male Indigo Bunting would be dingier on the underparts and plainer on the face and back. On to the sparrows. Of the Zonotrichia, only White-throated shows such prominent streaking on the underparts in a plumage that would be seen in the Midwest. A White-throat would have prominent wingbars and the underparts would look dingy. All of the Ammodramus have some streaking on the underparts but the underparts on most are buffy in color. Also, the two bold whisker stripes of our quiz bird are absent in LeConte's, Nelson's Sharp-tailed, and Grasshopper Sparrows, and too thick for a Henslow's. Juvenile Field, Chipping, and Clay-colored Sparrows also have some streaking on the underparts, though probably not as extensive as the streaking on our quiz bird. The two bold whisker stripes mentioned earlier are absent in Chipping and Field Sparrows, and Clay-colored has a prominent median crown stripe. All three would also show contrasting pale wingbars. Of the Melospiza sparrows, Swamp is darker overall and has reddish wings, Lincoln's is grayer overall with finer streaking on the underparts, and Song is browner overall with thicker streaking on the underparts. Song Sparrow also has a thicker malar stripe than our quiz bird. Vesper Sparrow is more finely streaked overall and has a white eye ring. 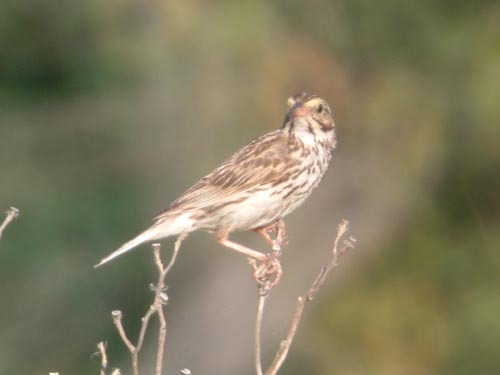 By elimination that leaves Savannah Sparrow, which is what this bird is. Note also the yellow supralorals (the area immediately above the lores), a good mark for Savannah Sparrow when present. This Savannah Sparrow was photographed at Montrose Point in Chicago on July 20, 2005.